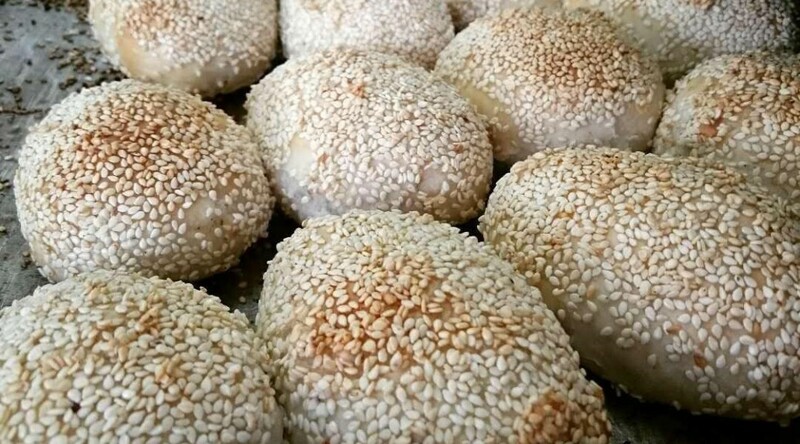 Luó bo sī bǐng–Turnip strips cake (萝卜丝饼) is originated in Jiangsu Province, which is a popular pastry near the area around Suzhou, Wuxi and Jiangyin. The recipe of turnip strip cake varies due to different place and time period. People usually eat turnip strip cakes for breakfast since it provides both pastry and vegetable, which is healthier than the deep fried pastries. Turnip strips cake are can be easily find at the breakfast vendors, as well as in some traditional eateries. The most traditional way to bake the turnip strips cake is to put it in a coal stove. When the vendor picks out a piece with the long “pliers,” you will definitely be appealed by the smell of the turnip strips cakes. With the development of the cooking supplies, more and more eateries choose to use electronic oven for convenience, but most vendors on street still keep the coal stove. The common price for a turnip strip cake is about 1.5 kuai to 3.5 kuai. lard oil, vegetable oil, salt, sugar, white pepper powder, spring onion. Flour, sesame, lard oil, vegetable oil, salt, water, yeast powder. 1. Chop turnip into thin strips, put some salt into the turnip strips and wait for 10 mins to squeeze the water out. 2. Boil the vegetable oil and pour the hot oil on the chopped spring onion to make the spring onion oil. 3. Chop ham/salted meat/fresh meat into small granule, seasoning with a little cooking wine. 4. Mix the turnip strips, chopped ham or meat, spring onion oil and the lard oil, seasoning the mixture with salt, sugar and white pepper powder. 1. Mix half of the flour with yeast powder and warm water. Let the dough rest for 30 mins. 2. Mix another half of the flour with the vegetable oil and the lard oil to make the oil pastry. 3. Make both of the dough and the oil pastry into thin pieces. The size of the dough should be twice larger than the oil pastry. Put the oil pastry in the middle, fold the two sides of the dough and then use the stick to roll the mixed dough into the original size. 4. Fold the mixed dough, and use the stick to roll it into the original size. Repeat at least three times. 5. Use the pastry to wrap the stuffing. Put some sesame on the top. Bake the raw turnip strip cakes in the coal stove or oven for 10-12mins. * Lard oil is essential in this street food and most lard oil is hand-made by the vendors. They chop the raw leaf lard into small pieces and then boil that in water; when water get evaporated, the lard oil comes out and eventually it would become pure lard oil. People usually store lard oil just in bottle or bowl because it would be concrete so that it’s hard to go bad. The left cracklings, for some people, could be their favorite snake. Many of the famous food in Shanghai, like wonton（馄饨）, bā bǎo fàn–Eight Treasures Rice（八宝饭）and etc. It’s also popular among southern China. Scientific research shows that lard oil contains high content of saturated fatty acids and cholesterol, which is good for health. Address: No. 2 Kangjia Lane, by Zhonghua Road, Huangpu district. Nowadays in Shanghai, the turnip strips cake is not the same as what people in Suzhou eat. The earliest version is to put the wet pastry in a small mould with the turnip strips, pour another layer of wet pastry on the top and then fry it, which is now called yóu dūn zǐ油墩子in Shanghai. Shanghai style turnip strips cake is a combination of the turnip stuffing with huáng qiáo shāo bǐng– Huangqiao sesame cake(黄桥烧饼), which is originated in Suqian, Jiangsu, so the Shanghai style turnip cake can keep both the golden brown flaky pastry and the juicy and tasty turnip stuffing. The turnip strips cake has been in fusion since it is introduced in Shanghai. One example is the fusion with the fried egg pancake from northeastern part of China, where people prefer to put stuffing like leek in the pastry. Instead of the flaky pastry, this type of turnip strips cake is thinner and crispier, because the plain pastry is fried. People first put a piece of pastry on the pan, then the turnip strips and the egg, and finally fold everything into a rectangle piece. Usually this kind of fried turnip strip are served with a special sauce.